John MacArthur, pastor of Grace Community Church in Sun Valley, California since 1969, has meant a lot to me in my Christian life. He was one of the first preachers I heard on the radio after God saved me. The College Career group I was part of recommended him and I’m glad they did. I learned an incredible amount listening to him on the radio with a notebook, a pen, and my Bible. For someone who was unfamiliar with the Bible, I quickly figured out where things were listening to him. After that, I started buying and reading his books, too. Here are five good books written by Pastor MacArthur. The Freedom and Power of Forgiveness. A study of one of the most important and difficult subjects – forgiveness. Ashamed of the Gospel. When the church becomes like the world, it has major problems and has ceased to be faithful to God. Our Sufficiency in Christ. Jesus really is all we need. Of course there are numerous other good books that John MacArthur has written, but these are a good place to start. Tolle lege! One of the most basic spiritual disciplines is meditating on the Word of God. “Oh how I love your law! It is my meditation all the day,” in Psalm 119:97. An unnamed psalmist wrote, “Blessed is the man who walks not in the counsel of the wicked, nor stands in the way of sinners, nor sits in the seat of scoffers; but his delight is in the law of the Lord, and on his law he meditates day and night” (Psalm 1:1-2). Journaling – putting your thoughts down on paper – is another way to meditate. You have to take the time to think about not only what you’re going to write, but what the Word says. There are all sorts of ways to journal. The “best” way is the one that works for you. 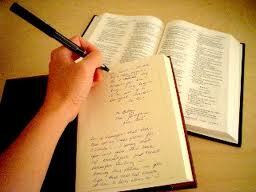 In my own devotions, as an example, I combine journaling and meditation with Bible study. I usually read at least one chapter of Scripture (I’m reading Hebrews now). I write a summary statement for the chapter, and then a brief explanation/outline of each section. After that, I pick what I call a “significant verse” and write it out with an explanation of why it stood out. 4:1-14 about their duty to obey God fully. 4:32-40 to remember that the Lord alone is God (there is no other). 4:41-43 by setting apart cities of refuge. 4:44-49 by introducing the reputation of God’s law. Significant verse: 4:9 — “Only take care, and keep your soul diligently, lest you forget the things your eyes have seen, and lest they depart from your heart all the days of your life. Make them known to your children and your children’s children.” We are continually exhorted to remember – and not forget – what the Lord has done and who He is. It’s easy for me to forget and go through long portions of the day with little thought of God or His blessings. He commanded the Israelites, and us, to “take care” and not let that happen. One of the ways we can do that, it seems, is to teach the things of God to the next generation. Lord, help me not to forget. Here is my sermon from this morning on James 2:8-11 in a sentence: Favoritism is a violation of love and God’s law and, as such, is no small thing. This is an excellent post – I recommend it highly. The story is very similar to my own. A big tip of the hat to Camille for the link. Check out her blog here. For those of you keeping score, yes I am one of those (hopefully not arrogant anymore, though). In his commentary on the book of James, Daniel Doriani makes a good comment about favoritism – the subject of James 2:1-13. Favoritism is almost a constant in human society. Some years ago, a group researched the way someone’s clothing affects the way others perceive him. They put a man on the street in a business district in New York City, pleading for cash with this line: “I’ve lost my wallet and need money for a taxi to the airport. This is my name, address, and phone number. If you loan me the money, I’ll repay you as soon as I get home.” They put the same man, wearing the same suit, on the same street, using the same line on consecutive weekdays. But in a year when beige was proper attire, he wore a beige overcoat one day and black the next. The result: his proceeds on the beige day doubled his proceeds on the black day. It was simple favoritism. Favoritism- showing preference to someone solely based on external appearance – is something deep within all of us. We tend to overlook it, but it’s there. There’s no easy three-step fix for it. Only our growth in the Lord (through His Word, prayer, fellowship, church involvement) and the power of the Holy Spirit can overcome it. From the sermon I preached today on James 2:1-7. Here it is in one sentence: Favoritism is forbidden for Christians because it disobeys God, displays ungodly thinking, and dishonors God. Life is like a meat tenderizer. All of the circumstances and experiences of life are sovereignly used by God to soften our sharp edges and make us more like Him. Before tenderization, our hearts, not to mention our attitudes and speech, can be harsh and unforgiving toward those in circumstances unlike ours. After being tenderized, however, we can sympathize and empathize with them in a way we couldn’t before. Please don’t be mistaken – we’re not justifying or excusing sin. It’s that our sharp edges have been smoothed and, and as a result, we’re more compassionate. God has many purposes in tenderizing his people. One of them is recorded in 2 Corinthians 1:3-4. “Blessed be the God and Father of our Lord Jesus Christ, the Father of all mercies and God of all comfort, who comforts us in all our affliction, so that we may be able to comfort those who are in any affliction, with the comfort with which we ourselves are comforted by God.” In other words, those who have been tenderized can comfort those who are in the painful process of being repeatedly struck by meat tenderizer which is life.